Sandeep Bhat, Jungho Ohn and Michael Liebling, "Motion-based structure separation for Label-free, High-speed, 3D Cardiac Microscopy", IEEE Transactions on Image Processing, Vol. 21, Issue 8, pp. 3638–3647, 2012. Cardiac tissue and red blood cells (RBCs) separation in bright-field microscopy images of embryonic zebrafish heart for motion estimation. The top row shows frames from the pixel data sequences and the bottom row shows the result of optical flow estimation on these pixel data sequences. 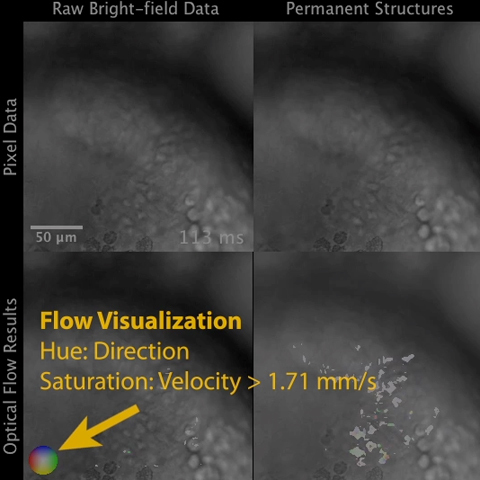 The flow has been visualized as dynamic color maps (using FlowJ plugin in ImageJ) where the direction of flow is given by the color (see inset color index) and velocity of flow is indicated by saturation of the color. The leftmost column shows the frames from the raw bright-field microscope sequence as acquired using a Photron FASTCAM SA3 camera mounted on a Leica DMI 6000B microscope equipped with a Leica HCX PL FL L 40x/0.60 objective. These frames were acquired at rate of 1000 frames per second and are of 512x512 resolution and show the beating heart of an embryonic zebrafish 72 hours post fertilization (hpf). Flow analysis of this sequence reveals cross-contamination of optical flow information in areas where the transient motion of RBCs overlap with periodically beating heart-wall. The center and the rightmost columns show the result of our separation algorithm. As seen from the flow results on the separated sequences, cross-contamination free optical flow estimation is possible on the separated sequences. Multicolor visualization of the separated cyclically moving heartwall, transient RBCs and static background structures. The top-left frame shows the images from a 2D+Time raw bright-field microscope sequence as acquired using a Photron FASTCAM SA3 camera mounted on a Leica DMI 6000B microscope equipped with a Leica HCX PL FL L 40x/0.60 objective. These frames were acquired at rate of 3000 frames per second and are of 512x512 resolution and show the beating heart of an embryonic zebrafish 72 hours post fertilization (hpf). The top-right frame shows recovered RBCs in red and remaining structures in blue. The bottom-left frame shows the recovered heartwall in yellow. In the left chamber we can observe the inner endocardium, the outer epicardium and the cardiac jelly space between them. The bottom-right frame shows all the cardiac structures. Multicolor, volumetric visualization of the separated cyclically moving heartwall, transient RBCs and static background structures. The left frame shows the images from a 3D+Time raw bright-field microscope dataset composed of twenty 2D+time sequences as acquired using a Photron FASTCAM SA3 camera mounted on a Leica DMI 6000B microscope equipped with a Leica HCX PL FL L 40x/0.60 objective. These frames were acquired at rate of 1000 frames per second and are of 256x256 resolution and show the beating heart of an embryonic zebrafish 72 hours post fertilization (hpf). The right frame shows the recovered RBCs in pink and the heartwall in yellow. One can observe the different cardiac events: blood flowing from atrium to ventricle (0-40ms and 290-364ms), blood flowing into the atrium and out of the ventricle (40-240ms), reverse flow from ventricle to atrium due to absence of valve growth (240-285ms). Multicolor, volumetric visualization of the separated cyclically moving heartwall, transient RBCs and static background structures. The movie shows the same volume present in the right frame of Movie3a but from three different viewpoints. The recovered RBCs are shown in pink and the heartwall in yellow. One can observe the different cardiac events: blood flowing from atrium to ventricle (0-40ms and 290-364ms), blood flowing into the atrium and out of the ventricle (40-240ms), reverse flow from ventricle to atrium due to absence of valve growth (240-285ms). Results of serial 2D optical flow on the different slices of 3D+Time brightfield dataset showing that improved flow analysis is possible of the separated sequences. From time-to-time, the movie pauses and highlights the important events to be observed.